1835~1860: born in the province of Aichi. He starts his career as a disciple of the travelling actor Arashi Kametarô and plays under the name of Arashi Kamezô. He meets the actor Nakamura Kanjaku II during a performance in Nagoya and becomes his disciple. He receives the name of Nakamura Kamezô at an unknown date. 1860: he gets married with the daughter of Mimasu Daigorô IV; Nakamura Kamezô takes the name of Mimasu Gennosuke III in August. 1st lunar month of 1865: Mimasu Gennosuke II joins the actor Nakamura Jakuemon I and takes the name of Nakamura Sôjûrô. 9th lunar month of 1868: Sôjûrô plays at the Kita-Horie Ichi-no-Gawa Shibai in Ôsaka the role of Sodehagi in the "Sodehagi Saimon" scene of the play "Ôshû Adachi-ga-Hara". His stage partners are Arashi Hinasuke VI (Abe no Sadatô), Jitsukawa Enjaku I (Abe no Munetô) and Nakamura Kanjaku III (Hachiman Tarô). 11th lunar month of 1868: Sôjûrô plays at the Minamigawa no Shibai (Kyôto) the role of Sodehagi in the "Sodehagi Saimon" scene of the drama "Ôshû Adachi-ga-Hara". His stage partners are the same as the Ôsaka performance in September. 4th lunar month of 1872: tour in Nagoya; Sôjûrô plays at the Wakamiya no Shibai the role of Kamiya Jihê in Chikamatsu Monzaemon's drama "Shinjû Ten no Amijima". 1874: Sôjûrô becomes zagashira at the Nakaza. 1877~1882: long stay in Tôkyô. he gains an incredible fame, costarring actors like Ichikawa Danjûrô IX or Onoe Kikugorô V.
October 1878: premiere at the Shintomiza of Kawatake Shinshichi II's drama "Jitsugetsusei Kyôwa Seidan"; Sôjûrô plays the role of Akisaka Awaji-no-Kami [casting]. 16 July 1879: Sôjûrô takes part in the gala night at the Shintomiza in the honor of the General Ulysses S. Grant [more details]. 23 May 1880: premiere at the Saruwakaza of Kawatake Shinshichi II's drama "Arimatsuzome Sumô Yukata"; Sôjûrô plays the role of Iba Jinzaburô [more details]. March 1881: premiere at the Shintomiza of Kawatake Mokuami's masterpiece "Kumo ni Magou Ueno no Hatsuhana"; Sôjûrô plays the role of Katagi Kozaemon [casting]. June 1881: premiere at the Shintomiza of Kawatake Shinshichi II's jidaimono "Youchi Soga Kariba no Akebono" [casting]; Sôjûrô plays the roles of Soga Jûrô Sukenari and Minamoto no Yoritomo. January 1883: Sôjûrô plays at the Minamigawa no Shibai the roles of Karaki Masaemon and Fujiya Izaemon in the dramas "Igagoe Norikake Gappa" and "Kuruwa Bunshô"; the role of the courtesan Yûgiri is played by Arashi Kitsusaburô IV. March 1883: Sôjûrô plays at the Naka no Shibai the roles of Momonoi Wakasanosuke, Yuranosuke and Satô Yomoshichi in the classic "Kanadehon Chûshingura". November 1883: Sôjûrô plays at the Kitagawa no Shibai the roles of Sonobe Hyôei and Akizuki Daizen in the drama "Shin Usuyuki Monogatari". January 1884: Sôjûrô plays at the Naka no Shibai the role of Iwafuji in the drama "Kagamiyama Kokyô no Nishikie". May 1884: Sôjûrô plays at the Minamigawa no Shibai the role of Matsuômaru in the classic "Sugawara Denju Tenarai Kagami"; he falls ill during the performance and has to be replaced by Arashi Kitsusaburô IV. October 1884: Sôjûrô plays at the Naka no Shibai in the dramas "Komagaike Chikai no Shigarami" and "Asahi Kage Ashibe no Manazuru". January 1885: Sôjûrô plays at the Minamigawa no Shibai the roles of Momonoi Wakasanosuke, Yuranosuke and Kakubei in the classic "Kanadehon Chûshingura". March 1886: Sôjûrô plays at the Ebisuza (Ôsaka) the role of Ichijô Ôkura Naganari in the "Ichijô Ôkura Monogatari" scene of the drama "Kiichi Hôgen Sanryaku no Maki". January 1887: Sôjûrô plays at the Ebisuza (Ôsaka) the role of Sasaki Moritsuna in the drama "Ômi Genji Senjin Yakata". March 1887: Sôjûrô plays at the Naka no Shibai the roles of Takebe Genzô and Kakuju in the classic "Sugawara Denju Tenarai Kagami". July 1887: Sôjûrô plays at the Minamigawa no Shibai the role of Saitô Bettô Sanemori ("Sanemori Monogatari") in the drama "Genpei Nunobiki no Taki". June 1888: Sôjûrô plays at the Kado no Shibai the role of Obiya Chôemon in the drama "Katsuragawa Renri no Shigarami"; the role of Chôemon's lover Ohan is played by Ichikawa Udanji I.
September 1888: Sôjûrô plays at the Kado no Shibai the role of Kiichi Hôgen in the "Kikubatake" scene of the drama "Kiichi Hôgen Sanryaku no Maki". October 1888: Sôjûrô plays at the Naniwaza the roles of Fujiwara Shihei, Takebe Genzô and Kakuju in the classic "Sugawara Denju Tenarai Kagami"; the role of Kan Shôjô is played by Ichikawa Udanji I.
November 1888: Sôjûrô plays at the Kitagawa no Shibai the role of Soga Jûrô Sukenari in the drama "Wagô Soga Homare no Fuji"; the roles of Soga Gorô Tokimune and Kudô Saemon Suketsune are played by Ichikawa Udanji I and Nakamura Jakuemon II. This performance celebrates the shûmei of Arashi Tokusaburô V.
February 1889: Sôjûrô plays at the Kado no Shibai the roles of Yuruki Saemon and Yamagataya Gizaemon in the drama "Keisei Somewake Tazuna". April 1889: Sôjûrô appears on stage for the last time, in Ôsaka at the Naniwaza, playing the roles of Nikki Danjô and Obiya Chôemon in the dramas "Meiboku Sendai Hagi" and "Katsuragawa Renri no Shigarami"; the role of Chôemon's lover Ohan is played by Nakamura Ganjirô I.
October 1889: Sôjûrô falls ill and dies in his home located in Ôsaka in the district of Kasaya-chô. The memorial service is done at the Abeno cemetery. Nakamura Sôjûrô was an outstanding and very popular wagotoshi, competing with Jitsukawa Enjaku I for the title of best Kamigata tachiyaku. It is said that Nakamura Sôjûrô and Jitsukawa Enjaku I were the equivalent in Ôsaka of Ichikawa Danjûrô IX and Onoe Kikugorô V in Edo. Nakamura Sôjûrô also acted in a wider range of roles, from katakiyaku to onnagata (for example the difficult role of Sodehagi in "Ôshû Adachi-ga-Hara"). He was opposed to the Meiji theater reforms and left temporarily the stage to open a dry goods business. Fans pressure was so strong that he returned quickly to the stage. The choice of this name was not at all related to another Nakamura Sôjûrô, who held this name in the first half of the eighteenth century, but was related to the Sawamura clan, more precisely to the Sawamura Sôjûrô line of actors: the name Gennosuke was usually held before taking the more prestigious name of Sôjûrô (this was the case for both Sawamura Sôjûrô IV and Sawamura Sôjûrô V). 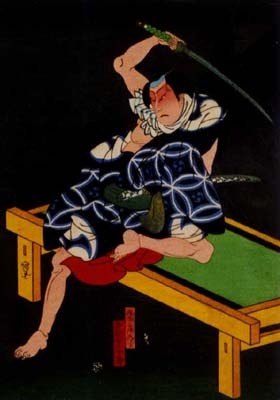 Nakamura Sôjûrô, who held the name of Gennosuke before joining the Nakamura clan, decided to use the first name Sôjûrô when he became a disciple of Nakamura Jakuemon I.